The recent death of Sri Shim by a boat propeller has energized calls for safer waters off Hawaii. Luke Evslin, injured in a high profile propeller accident 5 years ago, is also speaking out for the need for propeller guards. House Bill 2024 now calls for propeller guards / prop guards to be installed on all motorized recreational boats operating within 500 meters of shore. A House Committee will hold a hearing on the bill Wednesday 17 February at 9am. Those for the bill say it will save lives, boats still operate just fine, and propeller guards don’t cost much. Those in opposition say propeller guards are not necessary and will negatively impact boat performance. Hawaii Department of Land and Natural Resources has not taken a position on the issue. House Bill 2024 says propeller guards provide additional benefits. They protect propellers from damage, increase boat performance, deter propeller theft, qualify boat owners for insurance discounts, mitigate damage to marine life, and reduce turbulence and wake. The bill says a propeller guard means: An after-market physical barrier including a cage, screen, vane guard, shroud, ring, deflector, or similar technology designed to be installed on the propeller for protecting the propeller, marine life, or persons from damage or harm. 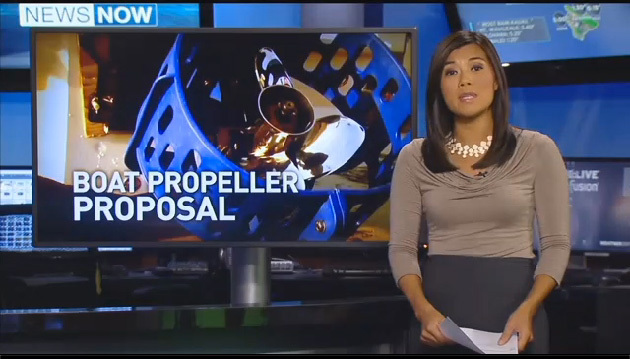 Hawaii News Now reports there have been 5 propeller strikes in Hawaii since 2011, three of those injured died. Thanks to Hawaii News Now for their coverage of this breaking story. I noticed a few people copied the list of objections to propeller guards from out site and submitted it. We only learned of the bill and the hearing this morning (17th). We are posting this page somewhere near the time the meeting is to start so we did not submit to the hearing. We checked the U.S. Coast Guard Boating Accident Report Database (BARD) for recent propeller accidents in Hawaii. It shows no recreational boat propeller accidents in Hawaii the 2011, 2012, 2013, or 2014 Public BARD (version released to the public). 2015 BARD has yet to be released. Under reporting (accidents not being reported) has long been a problem. Some states do not report their accidents due to privacy issues. We checked and 2008 was the last year Hawaii released their data. That prevents those studying boating accidents (such as us studying propeller accidents) from being able to see the basic accident data and learning anything from accidents in Hawaii. That makes 5 strikes of which two people were struck in one of them, and a total of 3 fatalities. Looks like we might be the source for Hawaii News Now’s accident count. I think we may be fact checking each other. We wish propeller guards were more broadly viewed as a propeller safety alternative, but are not for mandatory use on all recreational vessels in Hawaii. We assume this proposal will quickly fail due to industry opposition. Which guards are acceptable, which ones are not? Is a deflector acceptable? The proposed bill says deflectors are acceptable, outboards and stern drives have leading edges of the drive in front of the propeller. The industry says the leading edge of the drive can deflect logs, debris, etc from the propeller, is it a “built in” propeller guard? Do you have to have protection to the rear? Do you have to have protection to the front? How are you going to test them? How big of a mesh or hole in the guards is acceptable? What about entrapment? The industry says people can get caught in them. What about blunt trauma? The industry says being struck by a guard in the water can be even worse than being struck by a propeller. Guards create boat handling issues that can make some boats unsafe per the industry. Guards create drag reducing boat speeds and increasing engine emissions. Guards wlll increase travel time between the islands and fuel consumption on those trips. Are you going to require them on EVERY powered boat? what about sail boats with an outboard, very small boats, inboard boats, etc. Do we have to run them on high performance boats? Some outboard manufacturers have threaten to void their warranty if you install propeller guards. What about guards that flip up when underway to reduce drag, are they acceptable? The Coast Guard has a propeller guard test protocol but it is far to complex to be useful plus it has several other problems. The industry will say they have proof guards cause more harm than good. I see safety propellers on the list of acceptable alternatives in the bill. These have yet to be widely proven to be effective. The legislature will quickly be bogged down in all kinds of issues related to guards, give up, and move onto another topic just like the U.S. Coast Guard has countless times before. Propeller guards are not the only approach to boat propeller safety. We suggest a broader look at the many devices on the market, including training, and excessive use of alcohol. Then to draw up some parameters better fitting the situation in Hawaii. First, it is great that Hawaii has mandatory boater education. It has a few exemptions, one being for operators of vessels of ten horsepower or less. Hawaii has taken a leadership role in requiring boater safety education. We salute them for that. Second, Hawaii already requires propeller guards on the Sail Cat tour boats (large catamaran tour boats) at Waikiki. That is a good start as well. Safety propellers – ringed propellers and some propellers with rounded leading edges. The jury is still out on exactly how effective these methods are in real life applications. Continuing to reduce time to trauma center – the faster a propeller accident victim can reach a major medical trauma center, the higher their probability of survival. Train first responders how to respond to entrapment (propeller accident victim and/or their clothing are wound up on or into the propeller and the victims head may be submerged or waves washing over them. Public Service Announcements can be made to target propeller safety issues specific to Hawaii showing the Hawaiian environment making them more relevant. In much of the U.S. prop injuries tend to happen at the stern. People back over those in the water, the engine is running when people are boarding, people are pulled into the propeller from the stern. They are picking up fallen skiers or wakeboards and the stern swings over those in the water, etc. As a result, marine drives with the propeller further up under the boat are seen as safer in many applications. However in Hawaii, with a higher proportion of people being ran over in open water, some of these “up under the boat” drives may not prevent these types of accidents. Inboard boats (drive up under boat), tunnel drives, pod drives, and forward drives may still pose a significant hazard. First I would like to openly recognize propeller guards are a very emotionally charged issue. Those who have been critically injured or lost love ones want to see propeller guards on all boats. However, widespread requirements for propeller guards on all recreational boats near shore in Hawaii would cause all kinds of challenges. While many of the issues raised by the boating industry are not true of all boats, or of all propeller guards, they are true of some boats and some propeller guards in some instances. Widespread requirements would run into those problems and could end up creating more safety issues than it solved. However, the bill will be killed by boaters and the industry before it ever gets enacted. The industry often uses “unintended consequences” an argument against requiring propeller safety devices in specific applications. While we do not always agree on those counts, we do agree that wide spread requirements of guards on ALL recreational power boats near shore across the State of Hawaii would definitely created unintended consequences and they would not all be good. We can barely imagine the range of types of vessels that would be included in this proposal. That is not a good way or a safe way to start. Many similar bills have been proposed in other states and failed. Please don’t just fail and stop there. I am not in Hawaii and have never been there, but from what I have read and observed it looks like Hawaii has greater propeller risk exposure in the area of beaches, open water swimming, free diving, diving, spearfishing, tour boats, race support boats for canoe races etc. Hawaii might try to find the best tools to target those areas or whatever areas they feel have the greatest risk. Please do not forget Public Service Announcements and the existing mandatory boating safety training program can be great tools in educating the public of propeller injuries and how to avoid them. Here we have life jacket loaner programs at many sites. People just pick them up, use them for the day and bring them back. A loaner program in Hawaii might be established for dive flags and other dive marking accessories? We do not feel that propeller guards on every recreational power boat near shore in Hawaii is the best answer. As for smaller boats, Surf Saving Australia has a long history of using propeller guards. Plus over the last several years Australia has began requiring propeller guards on boats used with youth sailing programs, scouting and similar youth programs. They are also used by the military. Their version of OSHA, Occupational Safety and Health, has been fining organizations including universities for not properly protecting their people from propeller injuries. For those who would like to look very broadly at the situation, we have a very large Propeller Injury Mitigation Chart.